Most bookstore’s have little traditions built around recurring elements in our world. One of our traditions at DDG is the Rainbow Fairy Theme Guess. First of all, for the uninitiated, here is a little background information. Little is known about how Rainbow Fairies come into the world, whether they are hatched or not, but we do know that when they come into their maturity many Rainbow Fairies join a thematically related group. Past themes have been Dance, Color, Earth, Sports, Baby Farm Animals, Jewels, and so forth. Each fairy represents an element of her theme. 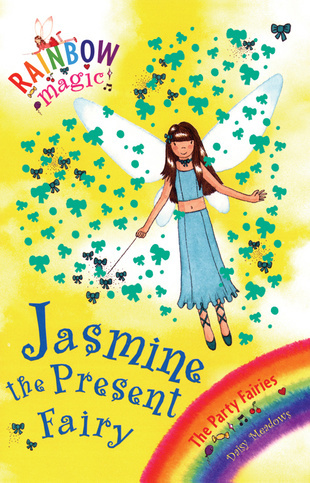 For example, the Party Fairies include Jasmine the Presents Fairy, and Polly the Party Fun Fairy. Or again the Candyland Fairies, whose members include Monica the Marshmallow Fairy and Gabby the Bubblegum Fairy. Some themes are rich enough to have two related incarnations. For example, the Candyland Fairies came after the Sweets Fairies, or again the Baby Farm Animal Fairies were followed by the Baby Farm Animal Rescue Fairies. 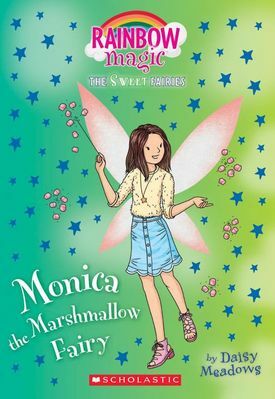 It should be noted that there are occasionally special Rainbow Fairies who stand alone, such as Kate the Royal Wedding Fairy, but by and large themed groups of Fairies, in sets of either four or seven, are revealed twice a year on the Scholastic frontlist. This brings us to the DDG Rainbow Fairy Theme Guess. 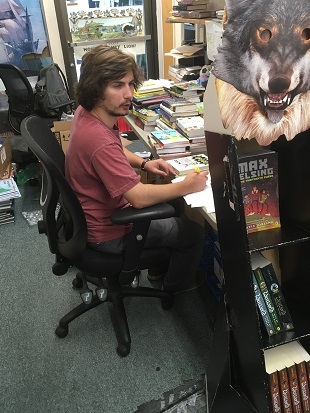 Before I do the Scholastic frontlist ,everyone at the store that day makes a guess as to what will be this season’s theme. There is no cheating. Many of our guesses have seemed promising, Take the Tools Fairies, which might have included Henrietta the Hammer Fairy or Paula the Plane Fairy, for example. Yet none of our guesses, not the Activist Fairies, nor the Playground Fairies, nor the Transportation Fairies, nor the Fast Food Fairies, has ever been a winner. Whether they have come up short for being too progressive, too gender neutral, or just bad ideas, only Daisy Meadows, the magical name given to all Rainbow fairy authors, knows. At this year’s contest I think Karin came up with a sure thing: the Bookstore Fairies. This seemed like a lock. We could easily see the group of seven Fairies. Elliott the Receiving Fairy, who heals all damaged books. Sarah the Special Order Fairy, who makes all books available in Ingram’s primary warehouse. Rhonda the Returns Fairy, who simply waves her wand to make slow-moving titles disappear with credit instantly appearing in our account. Helen the Handselling Fairy, who bemuses her customers so that they are enamored with any book she hands them. Ellen the Events Fairy, who conjures an eager audience out of thin air for each event and then restores the store to order afterwards in a dazzling blur of motion. Diana the Display Fairy, who makes every display a beguiling wonder. Catherine the Customer Service Fairy, who resolves all issues with handy spells. Do we have a winner this year? Of course we do. If we’ve missed any Bookstore Fairies or winning themes let me know below. This entry was posted in Uncategorized on October 11, 2018 by Kenny Brechner. …and Sandra, the Sales Rep Fairy, who makes sure you’re always prepared for sales calls, and your orders are always smack on target. I love this! I always thought that “The Housework Fairies” would be a good one. Strong stuff Judy. Nothing could be more on point. Ah, this blog made me laugh! I’d like to suggest Mirabelle the Margins Fairy who can make sure every order qualifies for an extra few points or a co-op credit. Carmen the Comment Fairy thanks you for that stellar suggestion Megan. Considering the established existence of Wendy the Wine Bar Fairy and April the Aperitif Fairy I’m fairly sure that Penny is real too.